The proposal is based on a simple floor distribution: The day zone is on the ground floor, which connects to the patio; the night zone is on the first floor. On the second floor there is a multifunction room, and the rest is a terrace. In section, the staircase and the hole of a future lift join these slices. The common and most used areas of a detached house –the kitchen, the children’s study and the parents’ study- are placed there. 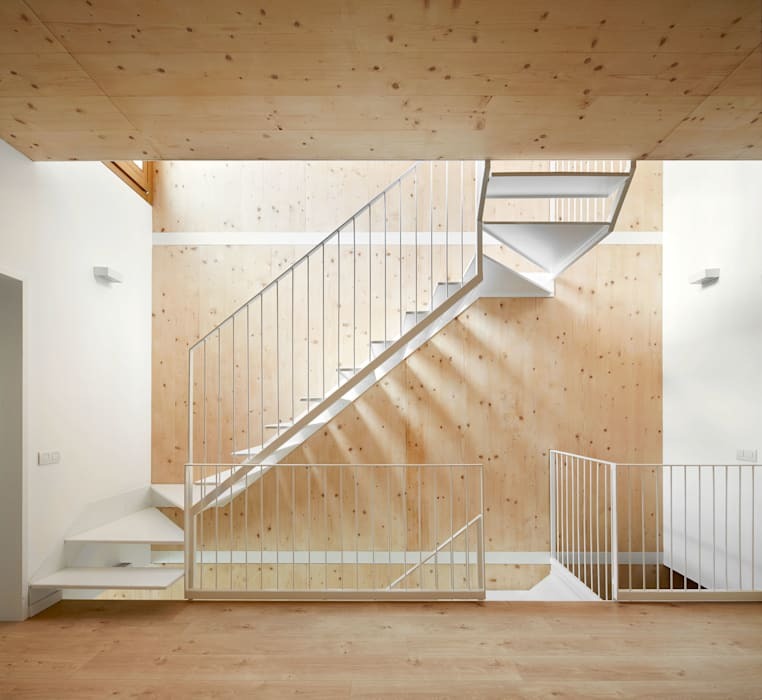 Both readings of the house, by floors and in section, enhance the functional and spatial relationship of rooms that might seem to have been placed in a too simplified way. In terms of construction, we choose a structure of big panels made of laminated wood, taking the most advantage of its characteristics and qualities: 1) It allows to solve the dividing walls by using little thickness and with a foundation flagstone with the same edge as a panel load bearing-base. It does not need digging out. 2) Together with the external insulation of façades and covers, it offers great surrounding thermal benefits. 3) The surface wood on the inside regulates the heat and humidity in the atmosphere, improving comfort in the house. 4) The deadlines for the realisation of the structure are greatly shortened. 5) CO2 emissions and water consumption are reduced during the building process. Laminated wood is reusable and has an almost closed life cycle. The strategy used for an energy-efficient home is to reduce its consumption by means of good covering insulation of the building and a good use of the heat gain and loss. The staircase and the whole of the second floor have big openings on both façades to provide air circulation and adjust its flow. In summer, just by opening the windows on the second floor, the study becomes practically an outdoor area, like a porch that allows cross-air circulation between façades and great flue at the staircase in the centre of each floor. On the other hand, in winter the closed windows make the second floor work as a greenhouse, optimizing heat gains. To deploy sunlight all windows are provided with Venetian blinds with slats that can be oriented. In the future, canopies and/or deciduous creeping plants will be fixed at the exits of the patio and terraces.